I love the way it turned out! The gold rings almost have an art deco feel, doesn't they? The last element was the sentiment strip with the awesome sentiment (from Scripty Sayings) embossed in gold. Thanks for stopping in today for the first Paper Smooches blog hop of the year! Kalyn's next on the hop! The gals have wonderful things to share today, so I do hope you hop all the way through! Hugs! Love the gold rings, so pretty!!! Looks like an awesome new die!! Love how you did it in gold!! Love this!! Gorgeous and graphic! LOVELOVELOVE the color palette!!!! The gold really makes an impact!!!! Love the new die!!! TFS! Love love love the gold foil! TFS!!! Whoa! That is COOOOOOL!!!!!!! I just LOVE it, JJ! Ooh, very cool and different...LOVE the gold! Wow, this is gorgeous! Love the colors with the gold. Just fantastic. Cool idea and the candy dots are the perfect touch! this card is awesome! i loooooove all the colors! The gpld is fantastic! Wow! What an absolutely gorgeous card! the gold makes it just so stunning. Love it. Way cool card and totally art deco-esque! Very creative. Love the gold. My first thought was Gold Record award... It would be perfect for a party invite if the theme was like 70's bandstand, I love it! Wow, this card is AMAZING! I love what you did with this die! Thanks for sharing! This is terrific! So glamorous and glitzy - I'm fer sher going to grab some gold foil paper and a rainbow die. Love your card. Cool card, so very JJ! Fantastic graphic card! Love your color choices and unique use of the rainbow die-cuts!!! 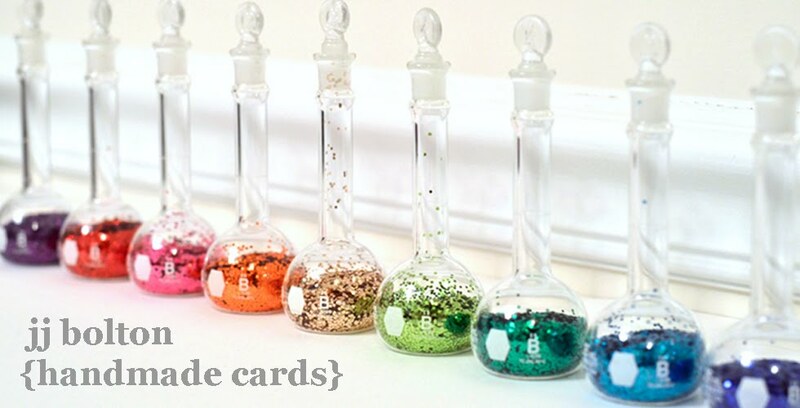 I love the graphic simplicity of your card, what a fun out-of-the-box idea with rainbow dies. What a lovely and unusual card. Of course in the best way. Love how you incorporated gold in the mix. Just beautiful. Are you kidding? This card is super awesome. Graphic awesomeness achieved! Adore the colors you used. My dream bedroom would be filled with these colors. Wow!!! Love everything about your card. this is beautiful. All the gold looks like a card to send to Cleopatra. Great idea. I shared the hop on FB. You always make the coolest cards! Love this one!!! This is just stunning! LOVE the color combo - so pretty!!! is an amazing card, clean and simple and so beautiful! LOVE these colors together and yay a rainbow die!!! Holy crow! This looks soooo cool, JJ! Dies are my new MUST HAVES . . . so many creative ways to use them and you just showed us one more! Thanks. I love the colors on your card! These cards are lovely! The first one is so interesting! WOW! What more can I say..................! Love it! This is so gorgeous and different JJ!!! I am bowled over!! Love this card so much!!!! Wow what a great graphic card...love how you used this rainbow die in this fun way. Love the gold rings. Just makes the card pop!! The gold is absolutely gorgeous!! I love your fun, trendy, funky style....this card is very creative. I love it! The gold touch is brilliant! :) Great card. Love it, pinned it! Wanna make it!! TFS! Oooh, this die is a "must have". I love what you did with it. Thanks for the inspiration. Utterly fabulous, JJ! I love it! So artistic! Thanks for sharing! Oh, I agree...it does have an 'Art Deco' feel, and it's fabulous, JJ! Love all the gold!!! Amazing - the gold is bold and beautiful. This is stunning, JJ! I love the gold! I tweeted! And YAY for you for not having word verification! um, get out of town!!! this is incredible!!!!!!!!!!!!!! first of all - the color combination - knockout!!!! and i love the retro almost 'record' feel of the card!! dude, this is amazing, i can't say that enough! that gold is GOLDen baby!! lol!! so love that die! Absolutely stunning! Useful die for lots of occasions, too! Fabulous card! I love this idea. What a different look for your card. Love the colors you used. Cool circles, remind me of the rings around the planets. This card is amazing!!! The gold looks incredible and love the other colours with it. Its perfection!! Awesome card! 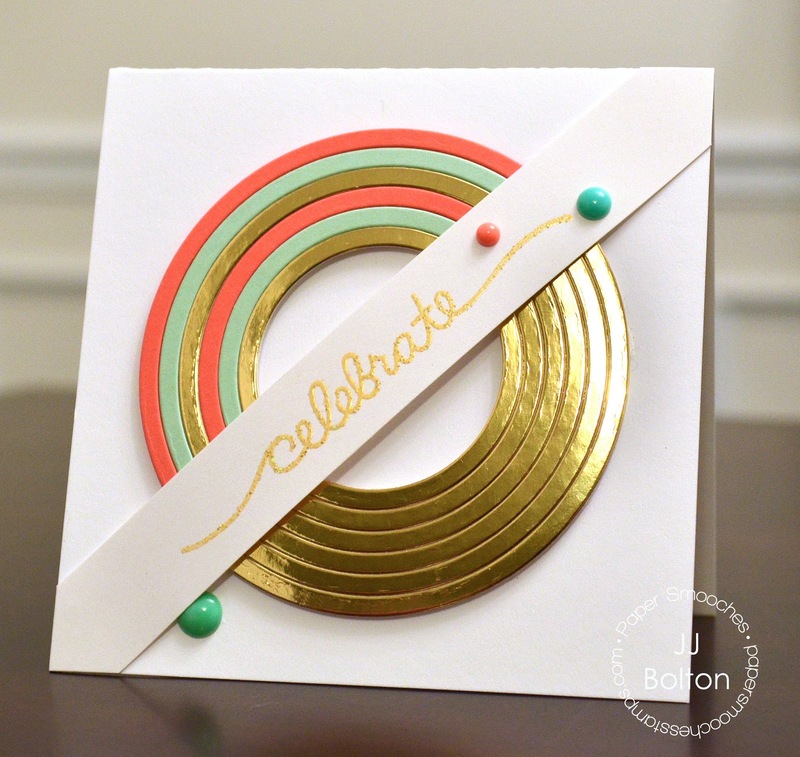 Love the effect using the rainbow die as a circle! Fabulous - love the colours and mirrored card! This card is awesome - so classic looking. I love the colors and the design! TFS! Gold...love it...that lovely minty green and coral...Stunning and vibrant and all things lovely! I like the gold, Very brilliantly done! That's one flashy and fun card! Art Deco looks great on your card! Go gold! Very art deco! Love that sentiment! Seriously, those colors, that design ... if it was a baby I would just pinch its cute little cheeks!! Awesome card! The gold just sings. Wow … your card just takes my breath away!! Wow - your card quite literally took my breath away - just gorgeous. This card qualifies as fancy/classy! LOVE those colors you used!! Are you using that paper again? I had that stuff in my hand last weekend when I was at M's and then thought that I'd be good and put it away...now I gotta go back. Very unique design. Love this die! WOW! Now THAT'S a different card design. Like it! LOVE the rings! Thanks for sharing your wonderful craftiness! This is perfectly amazing! Your card is drool worthy. I NEED those dies now. You created something truly special. Thank you for sharing. Graphic and COOL! Love what you did with the rainbow die! Wow...that gold is perfect on this card! Love it! I love your diecut rings. The really do have a deco feel. I think it's the color combination with the gold. So pretty! I tweeted about this blog hop. Wowza! That is all. I don't know if I commented before. I may have fainted and went to lie down. Seriously, you are the Art Deco Queen! Love the gold rings - the do have an art deco feel. I saw this card on Pinterest and was trying to figure out how you made it. I am glad that I saw this post. Such a clever card!! I love those gorgeous die-cut rings! So super pretty! Love this and the splash of gold is perfect. Wow!!! Beautiful card!! Love how you did the arches! And absolutely love that pop of gold!! Really makes the card!! And I love the sentiment as well!! It's great when dies can be used in many different ways like you have shown here. The gold on your card looks great! Wow, what a cool card. Love all the gold! What a stunning card. Love the way you have used these dies. 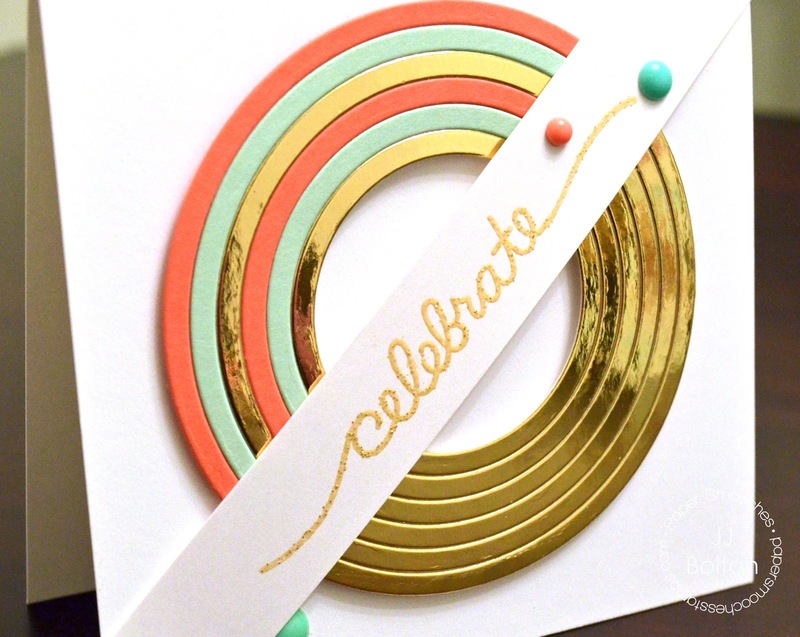 Love your card: the use of the colors and the gold to create that great circle!!! Wow, what an eye-catching card. Love the idea of using it for more than just a rainbow. Love the bling in your card! Gold, mint AND coral?! Yeah, one of my fave colour combinations right now!!! Way to go with this card, JJ. You stretched the creativity of the rainbow die and made it into a full circle. So stylish and so spot on with trends. Love the way you turned the rainbow into a circle...and the gold, lovely! love those gold rings-very cool! All the new releases are awesome as always! Great way to use the rainbow die. Beautiful card. What an inventive way to use the rainbow die! Love the colours! Super creative, super inspiring! A fabulous showcase of the new release! The gold is absolutely WOWza! Shared about hop on Facebook. Shared about hop on my blog. Love what you did with the rainbow die! WOW!!! How unique and spectacular! Beautiful card, I really love the colors! Wow, you got so creative with that rainbow die! LOVE this! This is sooo stunning! Love the pretty color scheme!